St. Francis Winery has been producing quality wines in Sonoma County for over 30 years. I have always particularly enjoyed their Merlot as it has been a staple in quality California Merlot ever since I started my wine career. They seem to always remain in the correct price category and maintain a great quality-to-price ratio. 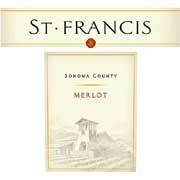 The 2006 St. Francis Sonoma County Merlot is composed of fruit from both the hillside and mountain fruit vineyards, as well as from vineyards located on the valley floor. I'm not entirely sure of the exact varietal breakdown of this wine, but the tech data sheet does indicate that the wine does have a percentage of Cabernet Sauvignon included in the final blend. The wine was also aged in both French ans American oak barrels for a period of twenty-three months. On the nose this wine has a fabulous bouquet that exhibits aromas of ripe blackberry, black cherry, dried herbs, vanilla, and a touch of cedar. On the palate the wine shows remarkable balance with a solid core of dark berry fruits such as blackberry, black plum, and currant, as well as secondary flavors of cedar-spice, vanilla, and dark chocolate. There is also a firm grip of dry tannins on the finish and hints of dried herb, which I believe would help the "blind taster" to pinpoint the varietal.